Kalvin Phillips after his two-goal performance for Leeds United. Picture Tony Johnson. New Leeds United boss Thomas Christiansen got off to a winning start as the Whites struck three times in the opening half to beat Bolton Wanderers 3-2 at the Macron Stadium. United were good value for their victory as they also hit the woodwork and had to cope with losing two defenders to injury without a proven defender on the bench. They made a dream start when ahead within seven minutes as a well worked short corner straight off the training ground was played by Pablo Hernandez to Kalvin Phillips and from just inside the box the young midfielder’s shot found the far corner of the net. Adam Le Fondre hit Bolton’s shot, but a weak effort was easily saved by Felix Wiedwald, one of three newcomers included in Leeds’ starting line-up - the others being centre-back Matthew Pennington and winger Ezgjan Alioski. The Whites quickly saw that they had to cope with long ball tactics by their hosts who smashed the ball forward from distance and bombarded the box with long throws. They coped with it well on the whole and took control with a second goal on 29 minutes. Kemar Roofe’s cross to the back post was headed back across smartly by Alioski to Chris Wood and last season’s top scorer then headed the ball into the net to get off the mark for the new campaign. Bolton finally caught United out with a cross as a corner was headed home by Gary Madine from close range with Wiedwald losing the flight of the ball. But within two minutes United had their two-goal advantage again as Wood was put through the middle and after stumbling squared the ball for Phillips who scored his second. Another goal almost followed when Alioski shot over from five yards after meeting a low cross. Madine then went close for the hosts as he chested down a long ball and turned to fire a volley from range just wide, but the half ended 3-1. United started the second period strongly as Alioski’s far post shot was saved by keeper Mark Howard after the Macedonian winger met a low cross from the opposite flank by Roofe. Vurnon Anita, a substitute on for Gaetano Berardi, who dislocated his shoulder, saw a 20-yard shot saved by Howard and it was beginning to look comfortable for the visitors until they lost a second defender. 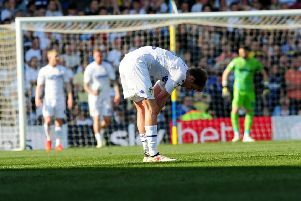 Adam Le Fondre clattered into Pennington in an aerial challenge and the on-loan Leeds defender fell awkwardly and had to go off injured - with the Bolton player not even penalised never mind carded. Conor Shaughnessy came on for his debut at centre-half and within two minutes gave away a penalty after pulling Madine’s shirt so far that he pulled it over his head. Le Fondre stepped up to put away the spot kick and it was game on again at 3-2. Leeds’ response was almost brilliant as within seconds they went down the other end and Hernandez was unlucky to see his shot from the edge of the box hit the crossbar. Bolton exerted some pressure late on, but United held on for their opening day win and could have added to their margin in injury-time when sub Hadi Sacko miskicked in the box. Bolton: Howard, Darby (Armstrong 84), Wheater (Burke 53), Beevers, Dervite, Taylor, Vela, Cullen, Karacan (Buckley 64), Madine, Le Fondre. Leeds: Wiedwald, Ayling, Pennington (Shaughnessy 64), Cooper, Berardi (Anita 37), Roofe, O’Kane, Phillips, Hernandez, Alioski (Sacko 84), Wood.